It struck me that as we approach the significant anniversaries of our country’s freedom, I need to remind myself that the men and women who made that commitment to fight, and who let their idealism spill over into the Civil War, often did so at great personal cost. The President’s father lost everything, even his wife and children because of his commitment. The children’s mother’s simple ambitions for a house and respectability were denied her. She was plunged into povery and depression. After the break up of their home in Limerick, Michael, his brother, and twin sisters were taken into their uncle and aunt’s home, near Newmarket-on-Fergus, who loved and guided them as their own. But visits to their mother, and news of their father’s wanderings were harrowing. It deeply affected them. It would haunt Michael D for many years. John Higgins, his brother, and sister, were all involved in the War of Independence; and in the Civil War which followed. John had been on the Republican side, his brother was a Free Stater, while their sister was in the middle as an ex-Cumann na mBan member. John had abandoned a successful career in the drapery business because he believed in a republic. He had been an intelligence officer with the North Cork Brigade. After years of difficuty, he eventually got a job in Charleville. But when his past allegiences were discovered, he was informed that ‘there would be no jobs here for Republicans’. With no money coming in the family was destitute. 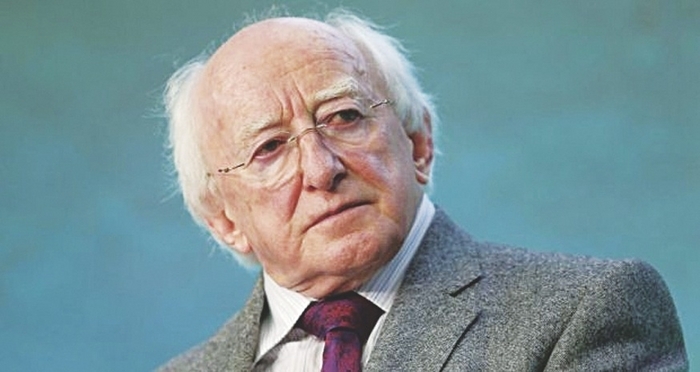 An ‘encounter with poverty’ had begun, as Michael D describes it. The children were taken away in a black Ford 8 car. All the details are vividly remembered by the President. Visits to their mother were difficult. She had lived her early life over her family’s shop in Liscarroll, Co Cork. She was an educated women who played the violin, and had books in her house. But now her spirit was broken: ‘She was bent, and leaning towards the fire’. The children would run outside and bring in the turf for her’ and silently vow ‘that for her at least, they would escape this life of poverty’. Later the girls were sent to relations in England, the boys to St Flannan’s College, Ennis. When Michael was old enough to relate to his father, he found a man ‘terribly wounded by life’. His energy was all gone long before Michael was old enough to see the man behind the ‘Father’. His father believed in fighting for Ireland. He had slept under reeks of turf, and in dugouts. He had developed serious bronchitis. He was on the run during the War of Independence; and again in the Civil War. He had been arrested, and imprisoned. People didn’t speak to him when he came home from the Curragh prison camp. He was unemployable. Children walked barefooted to the local Ballycar national school ‘ not because we didn’t have shoes or boots, but because that was what was done.’ Michael was blessed to have ‘a marvellous holistic teacher, by the name of William Clune.’ He was a man who loved the wonder of children. He knew the names of plants and bushes in Latin, Irish and English. On sunny days he would take the whole school to the top of the hill to show them the history of the local area. Master Clune had some extraordinary ideas. He delighted the children with his belief that if you tried hard enough, and really used your concentration, you could go back through not only your own memory, but other people’s memories to remember, for example, an Irish word. He also had an extraordinery sense of history in his own life. His brother Conor Clune, the Volunteer, was shot dead during the War of Independence. NOTES: * Born in Limerick city in 1941, Michael D is very much a self-made man. He was initially spurred by the poverty of his childhood, but latterly by the evidence that politics can effect change. He graduated from University College Galway, where he later became a lecturer in sociology and politics. He also holds degrees from Manchester University, and was a visiting professor at Southern Illinois University. He was formerly a Teachta Dála for the Galway West Constituency, and served significantly as Minister for Arts Culture and the Gaelteacht from 1993 to 1997. He was Mayor of Galway on two occasions. As well as being a fluent Gaelic speaker, the President speaks Spanish. He is a respected and well published poet. Michael D met his wife, Sabina (who played a blinder in her magnificent Irish designed clothes during their British visit ), thanks to the columnist and commentator Mary Kenny. She introduced them at a party in her home in 1969. They have four children, Alice Mary, John, Michael junior, and Daniel. ** I am taking these quotes from interviews conducted by John Quinn, and published by Town House 1997, under the title My Education.